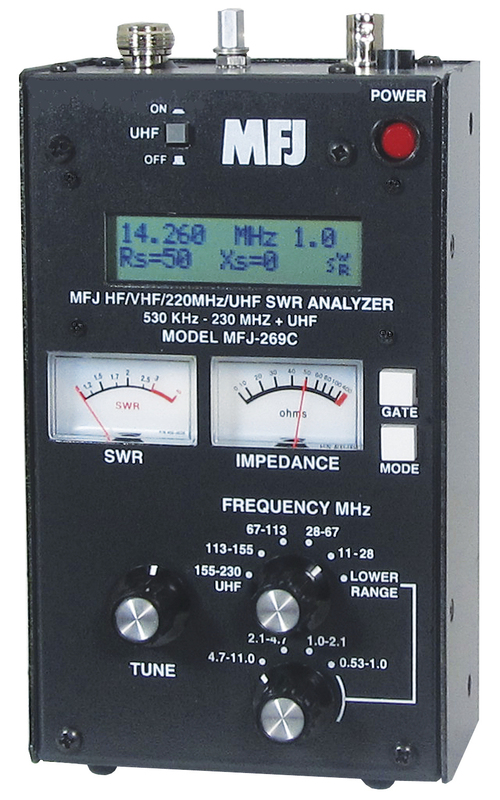 MFJ-269C covers 530KHz to 230 MHz and 415 to 470 MHz — an MFJ-269C exclusive! Includes all the features of MFJ-259C, the world’s most popular SWR Analyzer plus much more! Built-in CoaxCalculator — calculates coax line length in feet given coax length in electrical degrees and vice versa for any frequency and any velocity factor (great for building matching sections and phasing lines) — an MFJ-269C exclusive! New 12-bit A/D converter gives much better accuracy and resolution than common 8-bit A/D converters — an MFJ-269C exclusive! Super easy to use! Just set the bandswitch and tune the dial — just like your transceiver. MFJ-269C gives you a complete picture of your antenna. Read antenna SWR and Complex Imped-ance 530 KHz to 230 MHz. Built-in frequency counter. Also reads parallel equivalent resistance and reactance (Rp+jXp) –MFJ-269C exclusive! Measure SWR and loss of coax with any characteristic impedance, 10 to over 600 Ohms, including 50, 51, 52, 53, 73, 75, 93,95,300,450 Ohms — MFJ-269C exclusive! Fully portable, take it anywhere — on remote sites, up towers, on DX-peditions. Use 10 AA Ni-MH or Ni-Cad or alkaline batteries (not included — alkalines cannot be charged internally) or 110-240 VAC with optional MFJ-1312D. Compact 4W x 2D x 6 3/4H inches.